Name and briefly describe the types of motion in a patient's body that can produce artifacts in MR images. Describe the general appearance of typical MR image artifacts. 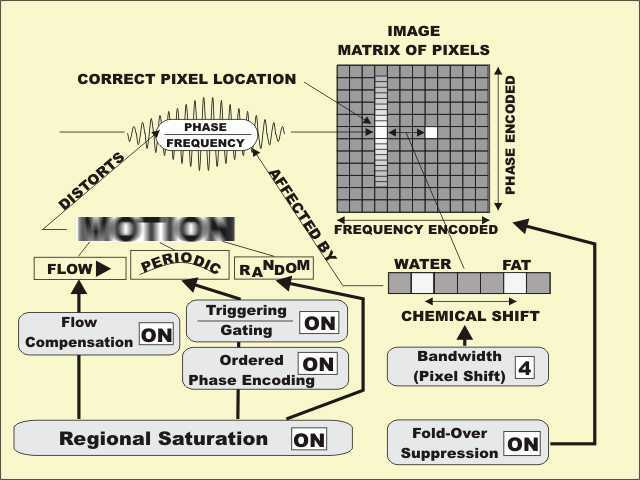 Briefly describe the types of MR image artifacts that are associated with the phase-encoded-direction. Briefly describe the types of MR image artifacts that are associated with the frequency-encoded direction. Briefly explain the general difference between motion blurringand motion artifacts in MR imaging. Explain why motion artifacts appear as streaks in the phase encoded direction. Describe the technique of cardiac triggering and why it is used in MR imaging. Briefly describe the concept of flow compensation and why it is useful for artifact suppression. Briefly explain why the technique of averaging can be useful in reducing artifacts from respiratory motion. Describe the concept of ordered phase-encoding and how it is used. Describe the process of using regional pre-saturation to suppress artifacts from respiratory motion. Describe how the technique of regional pre-saturation is used to suppress artifacts produced by flowing blood. Briefly explain why the technique of flow compensation might be useful in imaging procedures where you want to see bright rather than black blood. Describe the type of artifact that can occur if the image FOV is smaller than the anatomical body section and appropriate suppression techniques are not used. Explain and illustrate the concept of the over-sampling technique used to reduce fold-over or wraparound artifacts. Explain and illustrate how regional pre-saturation can be used to reduce fold-over or wraparound artifacts. Describe the chemical-shift artifact and what causes it. Explain why there is a relationship between the chemical-shift artifact and magnetic field strength. Describe the relationship between RF receiver bandwidth and the amount of chemical-shift artifact. Explain why it is not usually good practice to select the widest possible bandwidth to reduce the chemical-shift artifact.